My mission was to infiltrate a local operation rumoured to be manufacturing high performance components for the world’s fastest boats and richest people. Turns out, they’re hidden in plain sight on Matakana Road. I followed the No. 8 wire (clearly a clue) all the way to the old wooden cider shed, but what I saw was more like a scene from Breaking Bad than the latest Bond movie. Two gas-masked men in white paper paint suits emerged from between two containers. Suit-peeling revealed Andrew Rhodes and Aaron Hunter who took me into the shed and showed me what they’ve been up to. Solid Composites is a modern business operating globally via an international network of highly skilled collaborators, servicing clients that clearly place more weight on skills than suits, ties and flash offices. These guys are exceptional craftsmen whose skills were honed over multiple Americas Cup campaigns, proving they excel under extreme pressure with no excuses, no second chances. After so many years at the top of their game, Andrew and Aaron now have contacts scattered all over the world who continue to rely on them to translate state-of-the-art designs into reality, using composite (man made) materials. 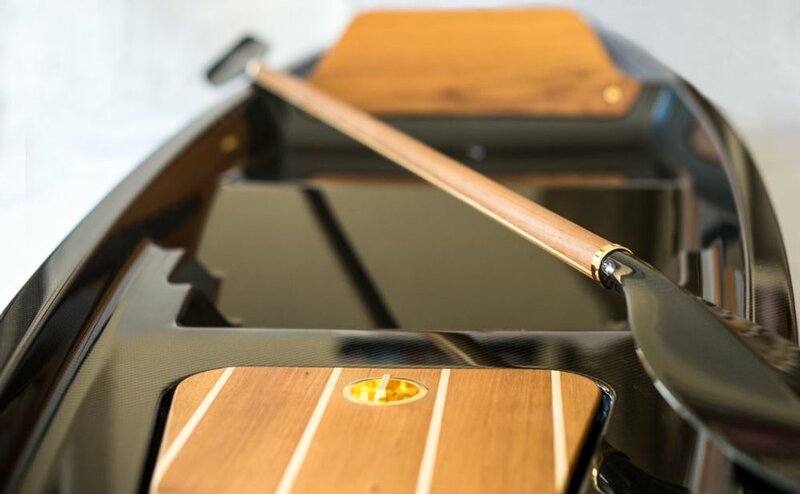 Recent projects include a carbon fibre kayak inlaid with teak and gold (yes gold) for a Middle Eastern royal; a one-off shower head worth more than most new cars for a super yacht owner; and hand-made, high-performance components for four out of six of the current America’s Cup teams. Prior to the Olympics, Solid Composites were asked to create a carbon fibre harness hook for the Dutch windsurfer, Dorian van Rijsselberghe. Dorian went on to win gold at Rio with what I mistook for a coat hanger lying on the coffee table in front of me. There’s no bread and butter work but it’s not all caviar and carbon fibre. Composites are more affordable than ever and are rapidly becoming a cost-effective construction option for mere mortals. Neighbouring farmers have twigged on to how useful these two are and they’ve just fabricated a new canopy for Matakana River Tour’s boat. The technology has limitless potential, particularly in domestic and commercial architecture. The boys are currently collaborating with Auckland-based TOA Architects on the design and construction of a bridge that will span a 30 metre gully, making an otherwise unusable residential section viable. They have several other top-secret projects on the go, but despite being a mother of teenagers with well developed interrogation techniques, I couldn’t crack them… they must be part composite.